One or more ESXi-servers, managed by vCenter server. These ESXi-hosts must be in a cluster to be able to configure that cluster for VXLAN-networking. (Even if you have just one ESXi-host it must be placed in a cluster.) Also the ESXi-hosts must be attached to a vSphere Distributed Switch for this to work. 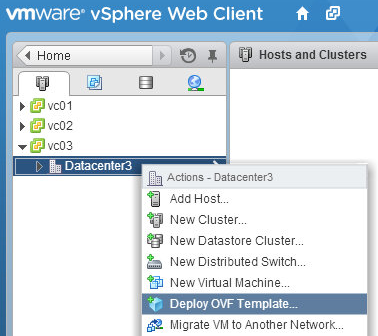 If you only have one physical ESXi-host to run a test-lab and that server also runs vCloud Director and vCenter then you must use one or more nested virtual ESXi-hosts to add to your cloud and not add the physical host to the vCloud Director server. You can download the evaluation software from this location: www.vmware.com/try-vmware. 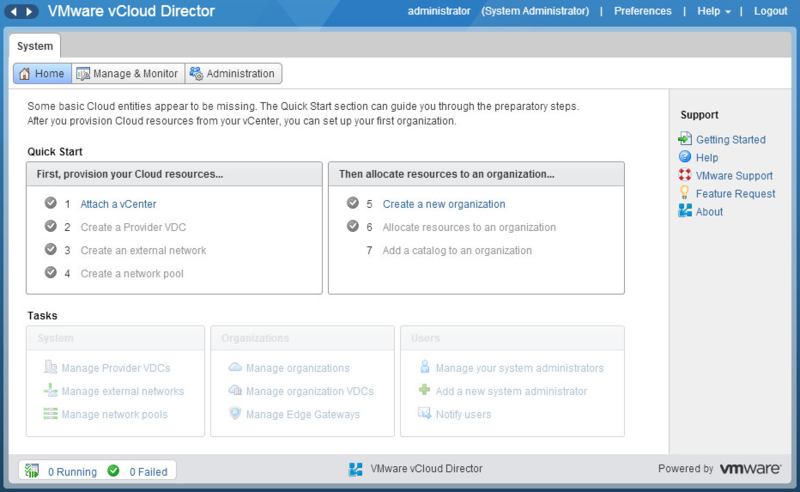 On the evaluation download page you will find the vCloud Director Virtual Appliance. This article is based on version 5.5. Next you choose the location in your datacenter and the storage location for the appliance. 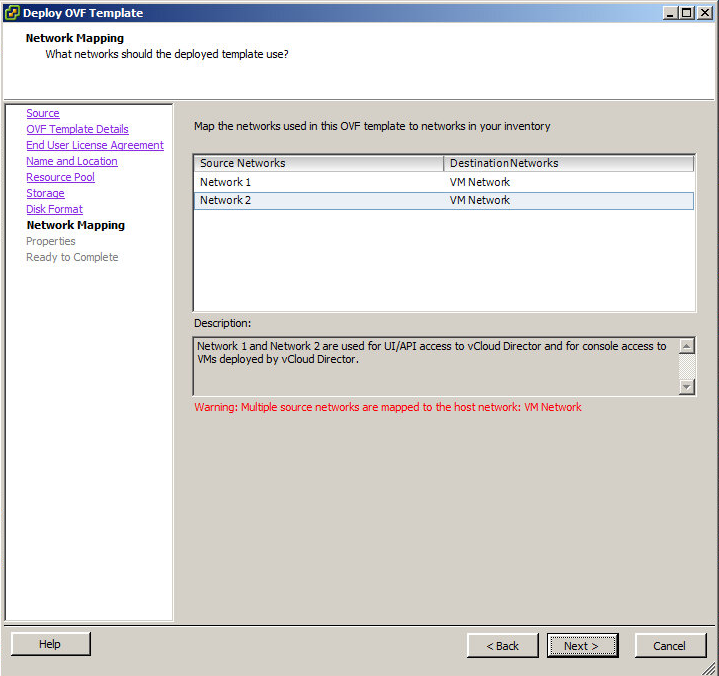 The following step in the deployment process is to attach the appliance to two virtual machine network port groups. These can be the same networks, both interfaces can be in the same subnet also. One is used for the management UI and the vCloud Director connection to vCenter and the other one for a console proxy to provide access to ESXi virtual machines. The next step in the configuration is to provide passwords for the Linux-accounts in the appliance. These are not used for managing the cloud. 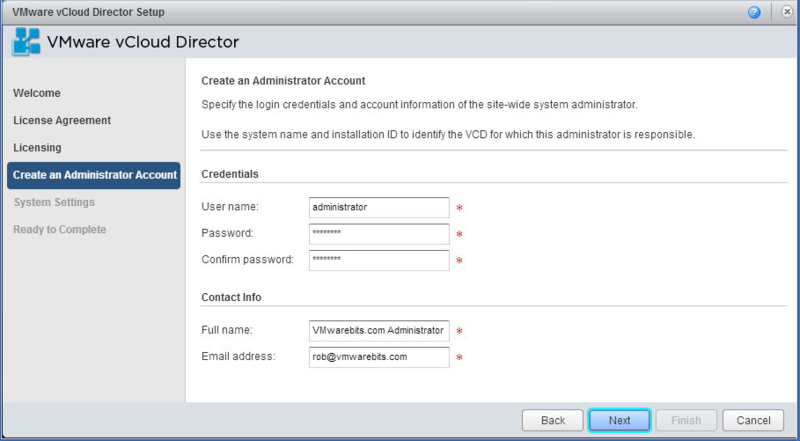 The administrator user and password will be created in the setup wizard later. For a simple setup for educational purposes or for a proof-of-concept installation leave the database selection to Internal. This will configure a database for you and eliminates the installation of an Oracle or MS SQL database server. The final step is to provide IP Address information for the network interfaces. You must provide two IP addresses. The lower one that you provide will be used for the User Interface and API access (also to communicate with vCenter) and the higher numbered address will be used for console access. In this example 192.168.1.156 will be used as the UI/management IP address we will use to login to and 192.168.1.157 will be used for the console proxy. When you are done making your selections a summary page will be displayed allowing you to have the appliance powered on after deployment. This usually is a good idea. 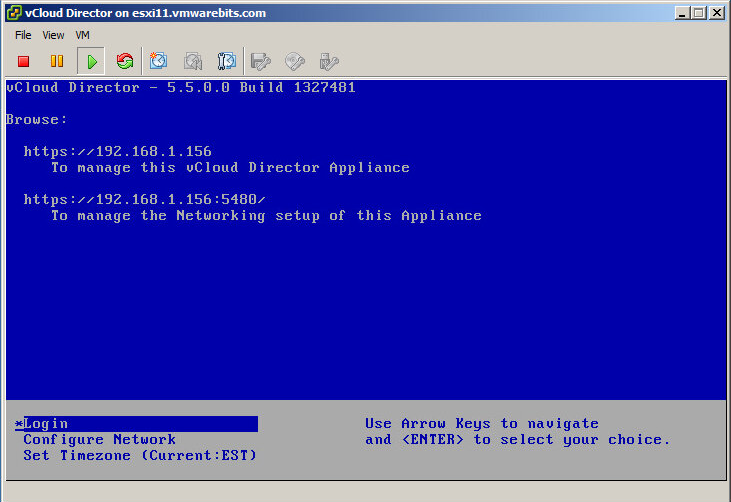 It takes a few minutes and after that your appliance will be started and you are ready for the next steps to configure vCloud Director. Once the appliance is started the console will display information about the URL's to use to login to the appliance. 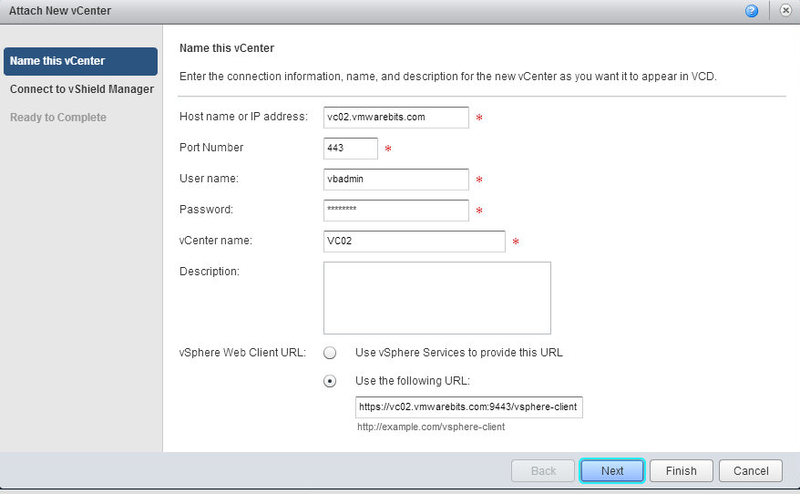 Access the vCloud web based management interface via the URL displayed on the console. The appliance comes with self signed SSL certificates so you can ignore any certificate warnings. When you access the web page for the first time you will be welcomed by the setup wizard. It let's you perform some basic tasks. You must accept the license agreement, provide a license key and enter details for the administrator account. At this step of the configuration you configure the username and password for your cloud. This will be a local user in your vCloud Director environment. Tip: If you plan to import your administrator account from an LDAP-directory (such as Active Directory) then use another name for the account here because you can not have two accounts with the same name. The administrator account you create here can be used as the backup administrator account for your environment in case the directory is not accessible. 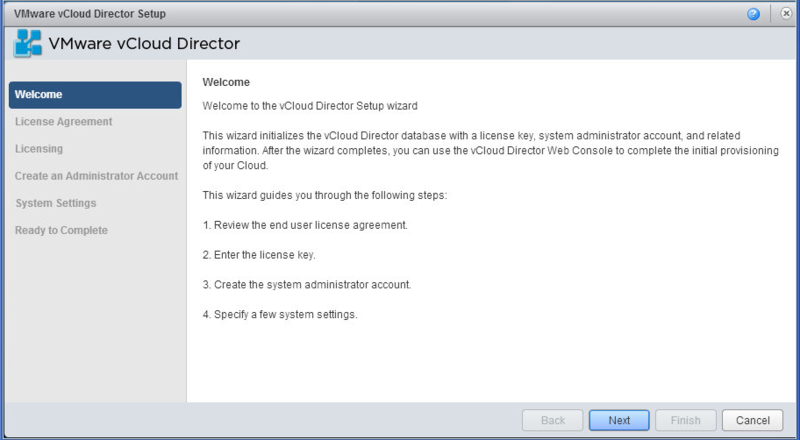 The last step in the setup wizard is to provide a name for your system and an installation ID. 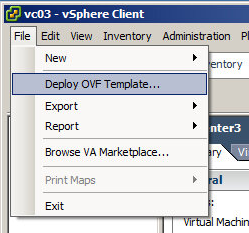 The name is used to create a folder in vCenter to place the vCloud Director objects. The function of the installation ID is to allow the system to generate unique MAC-addresses in your network. It uses this ID as the first octet in the machine-part of the MAC-address. In the cloud in this example a virtual machine would get this MAC-address: 00:50:56:01:00:72 (the first three octets are vendor-specific, VMware in this case, and the fourth octet is 01 which corresponds with the installation ID. You will not see this with virtual machines that you import from vSphere, those will keep the MAC-address they already have. It is only used for virtual machines created by vCloud Director. When you have provided all the information the wizard will summarize everything and you can finish the wizard if you have entered all information correctly. After the setup is complete you can now login to your cloud at the same URL with the addition of /cloud, for example https://yourserver/cloud. 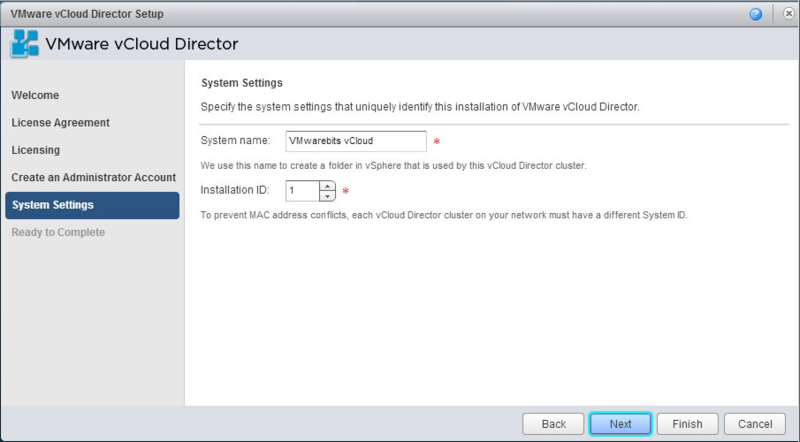 Before you can start building your cloud you must attach your vCloud Director installation to at least one vCenter server. That is also listed as step one on the homepage so you can't miss it. 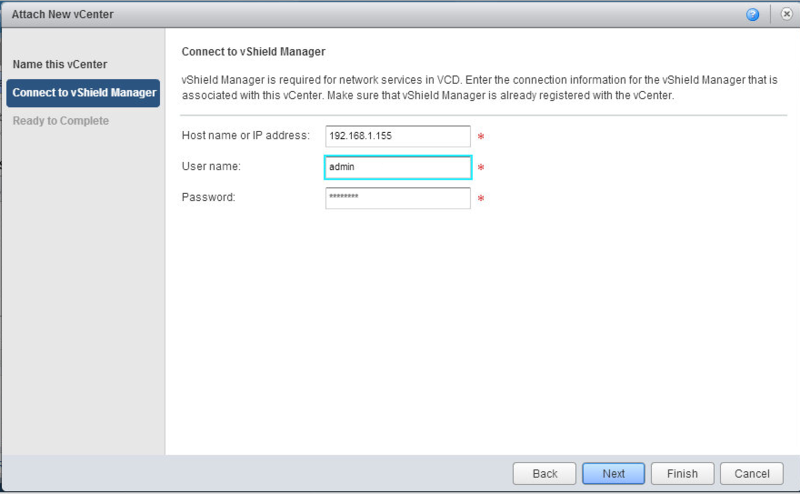 Your vCenter server should also have a vShield Manager server connected. That was listed in the requirements at the beginning of this article. If you did not install it already follow this getting started article to install vShield Manager. When this first step is done you are now ready to build your cloud.